THIS ITEM IS NOT AVAILABLE AT PRESENT. WE WILL NOT BE GETTING ANYMORE Batman v Superman Dawn of Justice Armored Batman Premium 6 Inch Action Figure. From the Batman v Superman Dawn of Justice collection by DC Collectibles. 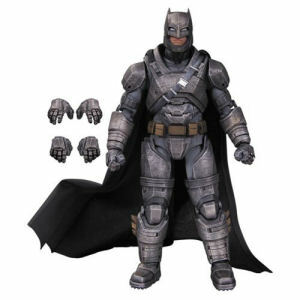 Batman v Superman Dawn of Justice Armored Batman Premium 6 Inch Action Figure. Action figure has multiple points of articulation and comes with two extra sets of interchangeable hands. DC Collectibles Batman v Superman Dawn of Justice Action Figures shipping from Canada. No Surprise Border fees or Customs!